If you are looking to increase your Google search rankings through SEO please reach out to me at jwojdylo@gmail.com as I offer several monthly packages. 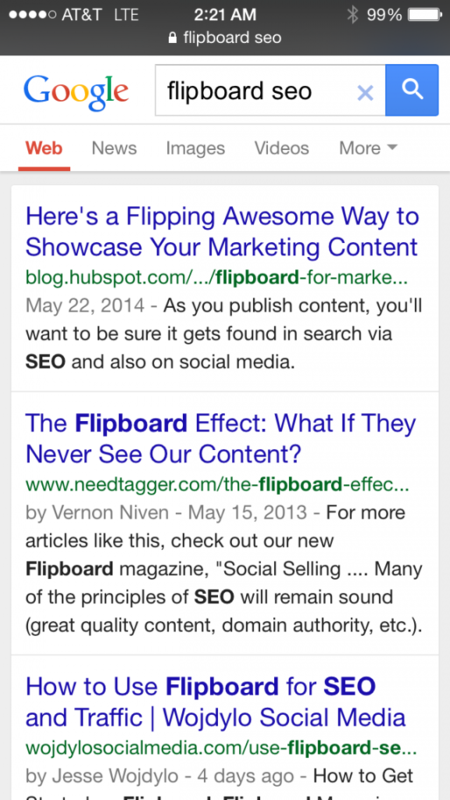 Over the last several months I have noticed many changes in Google search for mobile. I have access to both iOS and Android and, every once in awhile, one will be a little different than the other. On July 20th, 2014 I noticed there were only five (5) search results on the front page when browsing privately on my Safari browser on an iPhone. I picked up my Nexus 4 running Google Android KitKat and it still showed ten (10) search results for the same each search phrase. This makes me think Google is testing out different options for mobile search. Are Five (5) Search Results on the Front Page Better? When Googling this same search term on desktop or on Android you will find that my Wojdylo Social Media Flipboard article is at number eight (8) as of June 20th, 2014. Also notice the time in which I completed this search. Google tends to test things when there are number a large number of users. I would imagine there aren’t too many people searching Google on their iPhones at 2:21 am on a Sunday morning. One of the struggles I have with the search engine “news” industry is it is hard to find something you can believe. I stay away from some of the more “popular” search engine news websites because they are looking to drive traffic without doing the testing or research. I like to see something with my own eyes before I believe it. This is one of the reasons I stopped following all by 15 people on Google Plus. Fool me once, shame on you. Fool me twice, shame on me. I have lost a lot of respect for some that I thought were in tune with how Google search works. After reading a few of their articles in the last six months I can no longer trust what they publish. With this in mind, I will continue to track the number of search results on the front page of mobile with both my Nexus 4 Android phone and my AT&T iOS iPhone. On a mobile device, it makes sense that only five search results are needed on the front page. Although I tend to scroll down to see some of the lower half of the front page search results I am positive most people just click one of the first two or three results. Knowing others in the SEO industry I am also aware of the fact that being at the top of page two (2) is actually better than being at the bottom of page one (1). If being search result number six (6) is now the top of page two (2) it might be better off for that particular website. What do you think? Do you think Google should go to five (5) search results per page on mobile? Do you think this will eventually leak into desktop search as well? In my opinion, I think desktop search can stand to remain at ten (10) search results because the screen size is significantly larger than an iPhone or Android smartphone. Are we going to get to a point in which Google knows your screen size and can determine the number of search results based on that? When looking in Google Analytics it shows the screen size of the visitors to a website so Google already knows this information. As we continue to push forward into 2015 I think we will see quite a few more changes in terms of the front page of Google search. If you are looking to rank higher in Google search please feel free to reach out to me at jwojdylo@gmail.com as I have several packages available.